Pour the oats, cereal, cherries, m&ms, chocolate chips, and sunflower seeds into a large bowl and mix together. In a microwave safe bowl, mix the honey and peanut butter. Heat for 30-45 seconds until the honey is warm and you can easily mix the peanut butter into the honey. Stir in the vanilla. Pour the honey and peanut butter mixture into the dry ingredients and mix together, using your hands to get to the bottom of the bowl. 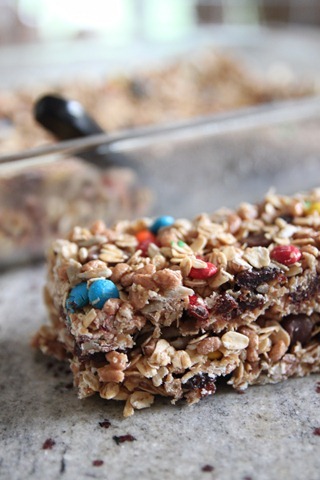 Dump the granola bar mix into a greased 9×13 baking dish. With greased hands or a piece of parchment paper, press the mix into an even layer in the dish, using as much pressure as you can while keeping it as even as possible in the baking dish. Cover the dish and place in the refrigerator for at least 1 hour before cutting and serving.